While on a hike in the Adirondacks last week, my wife and youngest daughter took this picture of what should be a green frog. I have never seen this blue pigmentation before. I think it's unlikely to be a mutation that will impart any kind of advantage unless it finds itself living on a blue carpet, and come to think of it, being blue in that case might not be an advantage. Frog populations are in decline all over the world. Evolution is expedited by changes in environment but if changes are too rapid, mutations won't keep up and extinction will result. Anyone else out there seeing blue frogs? I've seen blue bullfrogs around here on occasion (Southern Ontario north of Lake Ontario) It's uncommon, but not so rare that it's remarkable (search Google images for "blue bullfrog" and you'll see lots). 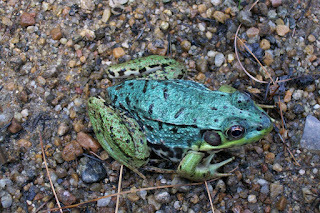 The green ones also have more yellow under the chin, so I assumed the green is really blue plus yellow, and the blue frogs don't make as much yellow pigment. I'm not sure why this fellow would have a blue back and green legs though. Thanks for the information. Interesting observation on the yellow throat patches. A mutation in the blue or yellow pigment genes could cause a blue frog, doubling the chance it will happen. Nature is fascinating.